The videogame collectible world is being shaken up again by the discovery of a one-of-a-kind item. 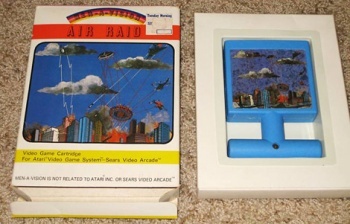 Air Raid for the Atari 2600 is one of the rarest items related to the system, with only around a dozen cartridges known to exist. As of this week, make that a baker's dozen, because AtariAge forum member Tanner has discovered another, but what makes it even more special is that he also has the game's box. The unearthing of an Air Raid box might not seem that special, but there aren't any other known Air Raid boxes in existence. That's correct, Tanner has the only one on the planet we know as Earth. He's listed both box and game together on eBay, where the bidding has reached $7,100 as of this writing, with more than seven days left. The auction is reportedly set to break record sales for Atari 2600 product, and possibly could rival the recent $41,000 Stadium Events auction. The Air Raid cartridge itself is pretty neat looking, colored a sky blue and shaped like like a T-handle so it can be more easily used as a weapon. Tanner is believed to be the original owner and bought the game in the mid-1980s. AtariAge.com admin Albert actually traveled out to Tanner's residence to verify the cartridge and box, and posted that he is "of the opinion this is a legitimate box and that someone is going to be adding a thus far one-of-a-kind box to their collection soon." "Everything about the box seems authentic to me, from the chipboard paper stock used, the offset printing, the die-cut nature of the box, the aging of the box interior, the insert with the plastic tray perfectly sized to the cartridge, the horrible typesetting (which would be a lot of work to reproduce digitally! ), the Tuesday the wear of the box, and more," Albert detailed. "Also, the artwork on the front of the box certainly was not 'blown up' from a label scan--as I stated earlier, it would have had to been redrawn from scratch to match the label artwork if this was a fake." The discovery was made close to April Fools Day, but this does not appear to be a joke at all. The world of videogame collectibles is always an interesting one, both in seeing what items are valuable and what people randomly end up digging out of their basements. This year alone, we've seen at least two very big discoveries that have (and will) earn their sellers thousands of dollars. Just in case anyone is interested, I've got a copy of Flintstones for the NES I'm trying to get rid of. I'm sure that's worth a couple thousand right?